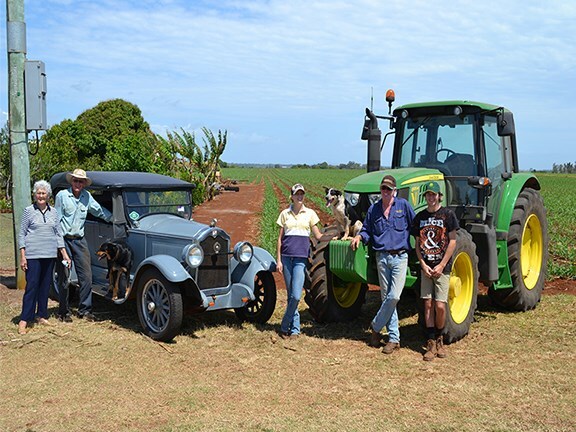 Margaret, Bob, Nicole, David and Chris Strathdee on the farm alongside their Buick and John Deere tractor. From a John Deere 40 tractor bought new in 1950 to a spanking-new 6105M delivered in September last year, the Strathdee family has run the gamut of farming technology from the iconic US brand. Over that period, the Queensland farmers have also seen a big change in the way sugar cane is produced. The Strathdee family settled in central Queensland shortly after the Burnett River, which empties into the Pacific Ocean not far from the city of Bundaberg in central Queensland, was discovered by an explorer/surveyor from ‘North Britain’ or Scotland, named James Charles Burnett in 1847. At about that time, a Scottish man named Robert Strathdee and his brother, where finding their feet in Australia, Robert settling in the Gayndah area of the Boyne River in the mid-1800s. Following a big drought in 1879 he moved on to a square mile of virgin country on the Burnett River, where he began running cattle and dairy cows. Robert named one of his sons Robert Oswald Noel Strathdee, and this Robert became chairman of the old Shire of Woongarra in 1927. A couple of years later, his son also called Robert (Bob), had a son who is the fourth generation of Robert Strathdee and lives in Rubyanna, near Bundaberg. Over Bob’s lifetime, there have been many changes in the way sugar cane is produced. Early in his life, all the farm work was done with horses (which, he remembers, did not result in hardening of the soil). His family had bought a tractor that had steel wheels and it was used for ploughing in in 1925, but there was still a lot of manual work to be done during planting and harvest. Bob remembers when burning the cane fields prior to harvesting became commonplace during the World War II years, as a result of a labour shortage. He witnessed the progressive introduction of machinery that has turned into the mechanised sugar cane farming that we know today and mentions a Crichton loader that was fitted to the back of a tractor with a three-point linkage, and then a J 150 big loader with a boom that went right out over the middle of the line, covering four rows. The first tractor with hydraulics the family ever had was a John Deere 40, bought new in 1950. They got a JD 430H (high crop) in the late 1950s, which is still in use with a sprayer on it. The early 1960s saw the John Deere 1010 series appear, and the farm got a new 1010C (crawler), as well as a second hand one, to follow the bulldozer to clear land. The family also has two 2010s, a new 2120, two 2130s, a 2140 that is used regularly, and a 6300 with its air conditioned cabin that was bought new 21 years ago, but still chuffing along fine. The latest addition is a John Deere 6105M that Vanderfield Bundaberg branch manager Allan Cooper delivered in September last year. Bob is also a classic car enthusiast and the proud owner of two 1925 Buicks, one of which belonged to his grandfather, and is still in mint condition.